This reconstruction shows another female mummy from the Redpath Museum. Radiocarbon dating indicate that she lived late in the period of Roman rule, when Christianity was on the rise in Egypt and mummification was soon to go out of fashion. 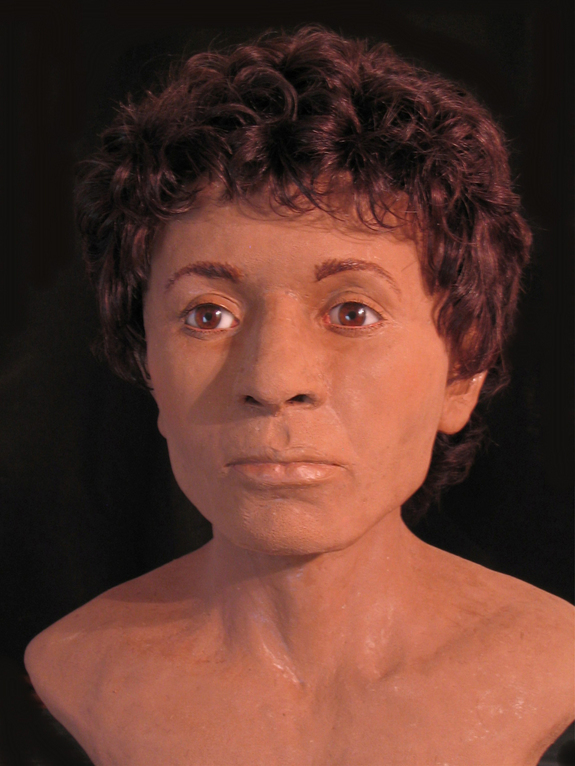 Studies of her mummy revealed her hair to be gray and it's estimated that she died between the ages of 30 and 50. She had severe dental problems including a cavity between two teeth and multiple abscesses. Credit: Courtesy Victoria Lywood. Another mummy, dubbed the "white-haired matron," is of a woman who lived long enough to see her hair go gray, likely passing away sometime between the ages of 30 and 50. Radiocarbon dating indicates that she lived late in the time of Roman rule (A.D. 230-380), when Christianity was growing in Egypt and mummification was soon to go out of style. At 5 foot 3 inches, she was relatively tall for her time, and museum records indicate that she was found somewhere in the ancient Egyptian city of Thebes (modern-day Luxor). She suffered from a problem quite common in ancient Egypt — bad, and rather painful, teeth. "Thecondition of the teeth of (the mummy) was poor," the team writes in the RadioGraphics paper, noting that she was missing several of them and that a large cavity, between two teeth, was visible along with several abscesses. This reconstruction is of a young mummified man, also in the museum's collection, who died in his twenties or early thirties. He lived a few centuries earlier than the other mummies, at a time when Egypt was ruled by a dynasty of Greek kings. He had severe dental problems as well, having multiple cavities including one that caused a sinus infection, possibly killing him. CT scans show that in his last days he had linen packing, dipped in medicine, inserted into one of his cavities to try and ease his pain. Credit: Courtesy Victoria Lywood. The third reconstructed mummy lived a few centuries earlier than the other two, at a time when a dynasty of Greek kings ruled Egypt. If he and the matron could talk, they could sympathize with each other’s dental problems. The 5-foot-4-inch male mummy had numerous cavities, including one that caused a sinus infection, possibly killing him. His condition was so bad that in his final days he had a form of linen "packing," dipped in medicine, inserted into one of his cavities. According to records he also was found in Thebes, with CT scans showing that he died relatively young, likely in his 20s or early 30s. Western University researcher Andrew Wade, a leading member of the team, said at a recent Egyptology symposium in Toronto that the development of high-resolution CT scans has played a key role in advancing the study of Egyptian mummies, including these three individuals, unveiling tiny details that help bring their past to life. "The high spatial and contrast resolution of the last decade of CT studies of mummies has allowed us to examine the paleo-anatomic minutiae (of mummies)," he said.